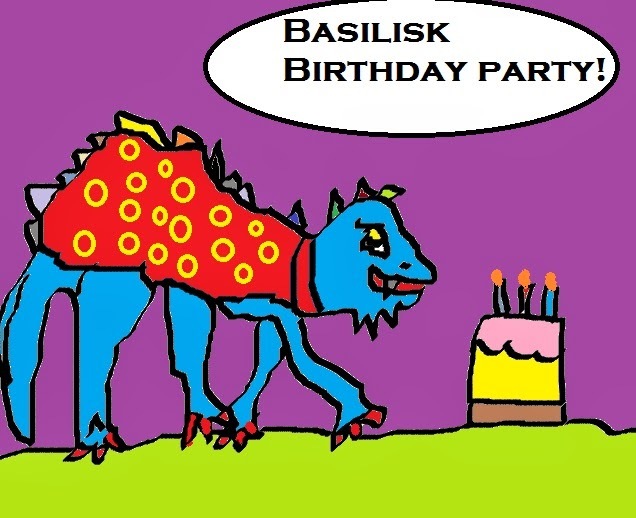 Thank you to all the friends who wished this basilisk a Happy Birthday. No one turns to stone today. You may have noticed from my first A to Z post that I like using MS Paint to create craptastic art. I’m not sure what inspired me to do this, but I I felt like I was getting tired of using random stock art from the internet for my blog posts. This inspired me to do my Bad Fantasy Art series. It’s basically just me dabbling with MS Paint and doing my best (or worst) to create something that might be memorable in some way. No discredit to actual artists who are very good at this sort of thing, but I felt like this would be a way to flex my creative muscle in a weird way and have fun at the same time. Being primarily a fantasy writer, I decided using the theme of fantasy art would be fun. This one is B for Basilisk Birthday Party. Even basilisks need a birthday every so often. Do you like drawing or doodling but aren’t very good at it? Would you like to do more of it just for fun? If you are good at art, what usually inspires you to create your best work? Let me know in the comments!